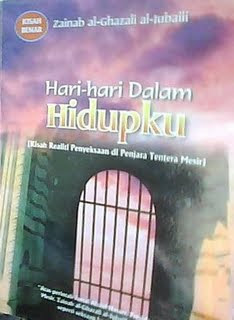 Muslimah Harapan Ummah: Who Is Zainab Al-Ghazali? Islam has provided everything for both men and women. It gave women everything--freedom, economic rights, political rights, social rights, public and private rights. Islam gave women rights in the family granted by no other society. Women may talk of liberation in Christian society, Jewish society, or pagan society, but in Islamic society it is a grave error to speak of the liberation of women. The Muslim woman must study Islam so she will know that it is Islam that has given her all her rights. This is the core of Zaynab al-Ghazali's thought regarding the status of women as expressed in her public lectures and her articles in al-Da`wa magazine, for which she was editor of a section devoted to the ideals of a good Muslim home. 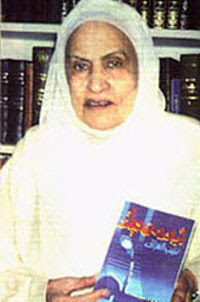 The thrust of her activism and that of her association is an educational one: to instill the doctrines of Islam in women's minds, teach them about their rights and duties and call her change in society leading to the establishment of an Islamic state which rules by the Quran and the Sunna of the Prophet. Pages from this book and instructions from Sayyid Qutb in prison, along with the set verses from the Quran, would be studied by groups of five to ten young men meeting at night in the home of Zaynab al-Ghazali or elsewhere. Discussions followed and views were established and opinions formed. With the agreement of Sayyid Qutb and the Muslim Brother's leadership, it was decided that this Islamic training program should continue for thirteen years, which is the duration of Prophet Muhammad's call in Mecca before he moved to Medina and established the Islamic state. It was also decided that at the end of this period, a survey would be conducted in Egypt to find whether at least 75 percent of Egyptian men and women were convinced on the necessity of establishing an Islamic state. If so, they would call for one; if not, they would continue their study and learning for another thirteen years--this to be repeated again and again until the nation was ready to accept Islamic rule, implementing Islamic law in accordance with the Quran and the Sunna of the Prophet. When the Egyptian government became suspicious and these secret groups looked to it like seditious political cells, a crackdown on Muslim Brothers took place in 1965. Muslim Sisters were not spared, the Muslim Women's Association was dissolved, and Zaynab al-Ghazali among others, was imprisoned. She was brought to trial with several others in 1966 and sentenced to hard labor for life, but she was released in 1971. In the open Islamic resurgence in Egypt which became stronger after the death of Abd al-Nasir in 1970 and since Sadat replaced him as Egyptian president, she was continued to be an active speaker and teacher of Islam, calling for the establishment of an Islamic state as the ideal toward which all Muslims should strive in order to have a society which is divinely guided by the Quran and the Sunna of Prophet Muhammad.